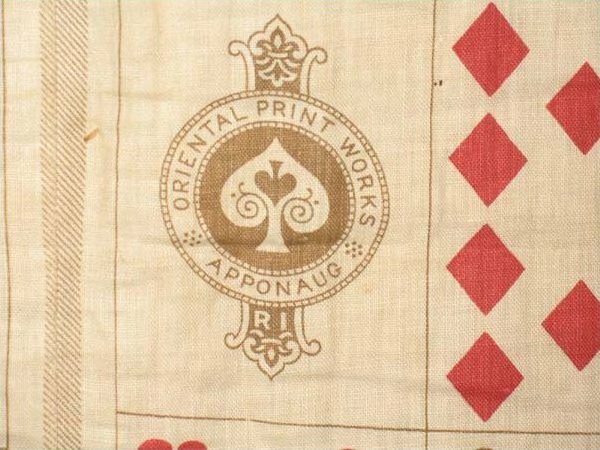 Rare whole cloth uncut yardage quilt made with fabric manufactured in New England by the Oriental Print Works Company; the company logo is contained in medallions repeated in the print. Depicts card suits of royalty- king ,queen, etc. Minor water staining does not detract from overall rarity and strength of this unique example of the American textile manufacturing industry that was prominent in New England during the Industrial Revolution.